Our annual musical production, Disney’s Cinderella Kids, was a smashing success. We had over 70 students in grades 1-5 performing under the direction of Allyssa Little and Nicole Mora. With grant support from both Lake Tahoe Educational Foundation and El Dorado Community Foundation we were able to host over 750 students from Lake Tahoe Unified schools along with two community performances in the evenings. Cinderella (AKA Lucia Solorzano-5th grade) even went on television to share about the play in costume. The singing, dancing, and performing was highlighted by the magical carriage which transformed from a pumpkin into a golden carriage and carried Cinderella away to the ball. There were so many people involved with creating this event, both with costuming, set design, make-up, sound and lighting, and volunteering the nights of the event. We thank each and every one of them from the bottom of our hearts. You each made this a life-time memory for so many children. Every year, I hear, “This is the best musical play ever!! !” only to hear it the following year too. The dedication of the staff and volunteers brings me to tears. This week we will be hosting our annual Tahoe Valley Talent Show. This event is our only fundraiser for the Tahoe Valley Scholarship Fund. Every former student who attended Tahoe Valley School is eligible to apply for this scholarship to help support their efforts in attending a university or trade school. This year, we already have 8 applicants vying for the funding. The Talent Show features students in grades 3-5 in a variety of acts. There is even a surprise “staff act” which features our teachers and support staff. The students work hard on their acts and we are always proud of their efforts!! The Talent Show will be held on Thursday, April 25th. There will be dinner available starting at 5:30 with the show beginning at 6:00. Raffle Baskets and other Prize Items will be raffled off for only $1.00. You do not have to be present to win! Again, this event is the only fundraiser for our Scholarship Fund. If you would like to donate to this amazing needed Scholarship, please contact the office or attend our event and be prepared to be amazed, and laugh a little. Cinco de Mayo is coming up soon too. Our Cafecitos (Hispanic) families are busy cooking and preparing for this cultural event. It will be held on Thursday, May 2nd with dinner sales beginning at 5:00 and the dancing program will begin at 6:00. Our local Folklorico Dancers will be performing along with our TK and Kindergarten students. Make sure you arrive early as the food always sells out!! Our Cafecitos families are a strong support for our school and work tiredlessly to share their culture, delicious food, and fundraising efforts. They are the main reason we have our electronic sign out front of the school as their fundraising efforts were key. They support the programs fully at Tahoe Valley through their volunteering and funds. Please consider joining the Cafecitos program which is held each Wednesday in the Staff Lounge starting at 9:15. We are in the midst of a Snow Day, yet some of our dedicated staff have finally made it into school to do a little pre-planning and lesson design. This is one of the reasons that it is important to keep your phone number and email current, as the School District sends out notification as soon as they are able to notify families of changes to the school day. Please sign into your Aeries Parent Portal to update as often as needed. TK and Kindergarten Round-Up dates have been set. Please contact your “Home School” to get signed up. Every incoming TK and Kinder student will have an incoming assessment completed along with all paperwork. Please visit the Early Learning Center link on this website for more information. TK and Kindergarten Round-Up in set for April 29-May 10. The appointments are on a first-come/ first-serve basis. Students will not be able to attend TK or Kindergarten until all paperwork and immunization records are complete. We are starting to put out a Tahoe Valley Weekly to parents informing you of all events, programs, and new community resources. It goes out every Friday night directly to your email so you have advanced information each week. Please make sure you read and enjoy!!! We are working hard to provide a quality education and well-rounded programs for your child. We hope you are proud of all we do for you and your family too. Make sure your phone number and email are kept current as this is how you will be contacted and notified of Snow Days. If the district calls a Snow Day, school is cancelled and one day is added to the end of the school year. They only call Snow Days when the weather and conditions on the road are unsafe. You can also check in the morning online www.ltusd.org as they post it around 5:00 a.m.
Make sure your child wears their winter clothing daily. All children go outside for all recesses unless it is RAINING or BELOW 10 degrees. This includes a warm jacket, snow pants, boots, and gloves. If you need help with obtaining these items, please let your child’s teacher or the Office know. Allow enough time to drive to school and arrive on time. The winter conditions cause slower travel time and occasionally you will have to use an alternative street. SARB is still in effect and tardies and absences are counted. Coming to school daily is one way that parents can insure their child a bright future. Show that education and attendance counts and matters!! Snow boots are not appropriate P.E. attire, so on the days that your child has P.E., please make sure they pack their tennis shoes in their backpack. Parents and teachers provide a joint partnership in supporting students on their educational journey. Parents are a child’s first and most important teacher. You know your child the best and have the most information and insight on how they learn best along with knowing a child’s challenges, strengths, and opportunities. Parent-Teacher Conferences are a key event where we can focus on each individual child and work together to design an educational program tailored for each child using the available resources. We will be meeting with every family during the week of October 15-19. To provide enough time for conferences, students will be attending school on a minimum day schedule all week. Students will be dismissed at 1:00 each day. Every family will be scheduled during the morning and afternoon hours. Please make sure you connect with your child’s teacher to set up a conference time and set this time as a priority. If the unexpected occurs and you will not be able to attend at the specific time, please contact your child’s teacher or the office immediately so we can reschedule (530) 543-2350. We also want to remind every family to complete an application for free/reduced lunch (even if you do not qualify). The School District is providing a bonus to the schools if we have all of our parents complete the application. The funds they will give us goes directly to your child’s programs. We can send home a paper application home if needed. We also have computers available in the office so you can easily complete the application online. If you prefer to complete it at home please click on the “Resources/Parents” tab on this website, and then click on the “Meal Application”. This will take you directly to the application also. Regular school attendance is one more key way that families can support their child’s academic growth. Research has proven over and over the benefits of attending school daily and arriving on time. One easy way to ensure your child arrives on time daily is to set an alarm on your cell phone (with a back-up alarm if needed). You can bring your child to school at 8:45 a.m., which is well before the beginning of the school day at 9:10. Tahoe Valley also has an on-site morning daycare program (Kid Zone) which runs daily from 7:00-9:00 a.m. for the price of $5.00 per day. To sign up, please call the office for an application or stop by to fill one out. Show you care and put your child first. Get them to school daily and on time. Welcome to the New Us!! Adding General Music and Instrumental Music to our curriculum. All students will learn about music, theory, rhythm, and how to play in concert with others. We are busy purchasing the curriculum and instruments. Miss Little is shaking with excitement at getting her dream in place. The students will be showing off their new instrumental playing during the concerts this year. Miss Little will teach the students twice each week. Once for choral and once for instrumental music. We have moved the Library to C21 and it is spouting off new paint and carpeting along with a new design. We have a new Performing Arts Center located behind the stage (where the old library was housed). It also has new paint and a whole new look. This is Miss Little’s new classroom and music room. A new lending library is located outside of the breezeway between the main building and the Early Learning Center wing. Families can stop by at anytime, pick up a new book to borrow, or leave a book for others to read. This lending library has been made possible through a grant from the Bessie Minor Swift Foundation. This lending library concept can be found throughout the U.S. and we are lucky to have one on our campus. Enjoy the borrowing!!! New paint and carpet in our P.E. room and Ms. Mason’s room!!! And new flooring paint in our bookrooms and PTA storage room. We will be getting new cafeteria tables and benches this Fall and will be getting a new washer and dryer installed on campus too. I am so proud of our students and staff here at Tahoe Valley! We have the most amazing, dedicated staff who constantly go above and beyond daily for our students and families. When they see a need, they jump in feet first instead of waiting for someone else to do so. We had over 12 teachers donate their “Dream Money” to Ms. Little’s choir so they could attend competition for the first time ever. They knew how important it was to Ms. Little and one of her dreams and they wanted to make sure our students could experience this event. Our choir took the awards!!! 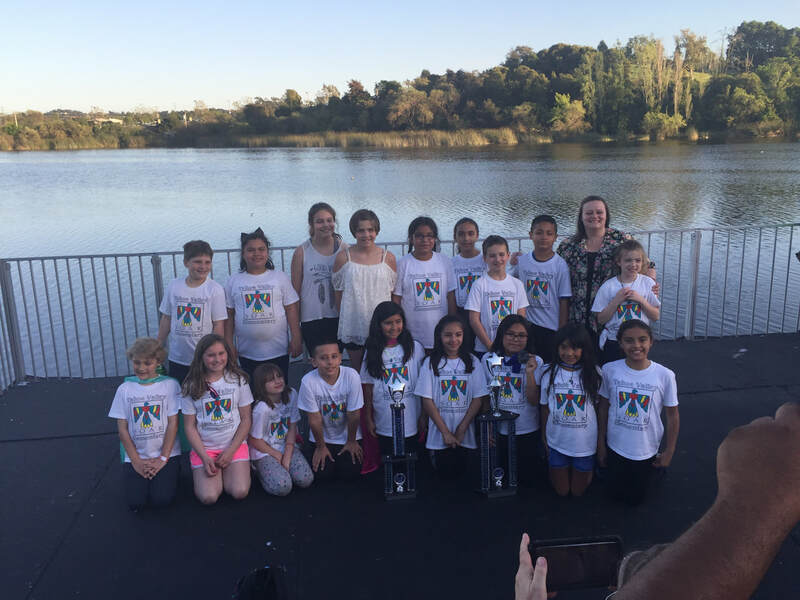 The result was an outstanding showing that netted the choir 1st place in their division, as well as 1st place in the overall elementary choir category, and a rating of excellence from the panel of judges! For their efforts they were award two trophies, one of which was almost as tall as many of the singers. One budding young star, Lucia Solorzano, was selected as the Most Outstanding Elementary Vocalist! With an ear to ear smile she was recognized in front of the entire auditorium for her outstanding performance. These are the opportunities that will last a lifetime. That is what Tahoe Valley is all about. Dream, Imagine, Try, and Achieve. For more information on the Tahoe Valley Choir, contact director Allyssa Little at alittle@ltusd.org . Enjoy the articles in South Tahoe Now, Lake Tahoe News, and Mountain News. Tahoe Valley School is collaborating with Lake Tahoe Paint & Sip to provide a specialized program for our students in grades 1-5. This is becoming so successful we are looking at adding this to our overall program to continue for years to come. Lake Tahoe Paint & Sip brings in one of their artists (Craig) weekly. He teaches the class how to paint with acrylics on canvas. He provides a grade-appropriate lesson and the students create an original painting based upon a visual model. The lesson is fun, engaging, and as one first grade student exclaimed, "I have a feeling of joy in my heart!” The paintings are on display weekly in the Library so all students can appreciate the uniqueness and creativity. At the end of the year, Tahoe Valley will be hosting an Art Exhibit featuring these works of art. Parents, families and the community will be invited, along with our mural artist, Nick Akins. We are hoping that this experience opens the positive benefits of the ARTS for our students. Watch for this event and please join us!!! We also have some creative students who actually created “snow dogs” during recess using our newly fallen snow. Enjoy!! We have some new and exciting programs which we are implementing this year. We just had our first concert with our fourth grade students performing on their new Recorders. They performed in two concerts and played three musical pieces. These students are learning how to read music, play in concert with others, learning general music rhythms, and enjoying creating musical sounds. We LOVE our visual and performing arts programs!!! Our phenomenal music/choral teacher, Ms. Little, just keeps looking for more ways to build our performing arts. She is working to secure funding to take a group of choral performers to festival in the Spring. If you know of any possible donors, please contact Ms. Little at alittle@ltusd.org. We have worked hard to build an inclusive environment here at Tahoe Valley. We have implemented our Positive Behavior, Intervention and Supports (PBIS) program and continue to work on refining the process. Our data has shown significant reduction in our referrals and the severity of issues. Every student is being empowered to be the best student possible and to show leadership in a variety of ways. We are proud of our Thunderbirds. Thank you also to Nick Akins a local artist. Our new mural is located on the outside wall of our Greenhouse Outdoor Learning Amphitheater. Local artist, Nick Akins, design and painted this work of art. It is featured on the front page of the Tahoe Daily Tribune. Thank you to Nick for sharing his craft and legacy with our school. Click here for the link to the news article. Also thank you to the Ingersoll-Yorkey families for connecting us with Nick. Enjoy!! Our school is in full swing. We have many new families who have just moved to the Lake Tahoe area joining us this year. We want to welcome each and every one of you and hope your school year is the most memorable one you will ever have. Our school year began with a Welcome Extravaganza. Our staff was out front on opening day, welcoming each and every student. Music was playing to help set the mood, and a fun balloon arch leading into our school provided the perfect backdrop. This is just a taste of the Tahoe Valley fun. We have expanded our TK program again this year, with four full classrooms. We have the amazing teaching team of Mrs. Shanks and Ms. Shanks as two of our TK teachers. Mrs. Shanks was seen for the last two years volunteering around our school almost daily. She stepped in to take over our additional TK class. Mrs. Shanks comes to us from Wisconsin and taught TK for over 20 years. (Although in Wisconsin it is called 4K.) Her smile is infectious and her positive attitude is above bar. Walk-a-Thon is set for this coming Friday. This is the event of the year and sets off our school with a bang. The music plays, kids and adults walk the field, laughter and smiles are the currency of the day. Please join us and volunteer your time. You won’t be disappointed. PTA will be kicking off their Membership Drive. Please fill out your Membership envelopes and share with your family as well. They are more than able to join and will enjoy the benefits of the PTA organization too. The one thing to know about Tahoe Valley PTA is that 100% of the funds raised at each and every PTA event goes directly to pay for field trips, assemblies, and student materials and resources. We put our money where it matters; directly for the kids!!! !